Street art should be left where people see it but occasionally works are left out deliberately with the intention that they be collected. A friend dismissed some pieces by Adam Neate only to discover she could have picked up something of value for nothing - he was giving them away. 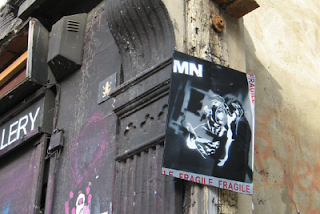 I was lucky enough to see this picture by MisterMN (above), with the following note on the back: 'Act 27, London 2009 - This Item is part of the London Street Art Collection and must be reported as soon as it has been found.' I contacted the email listed and received an extremely gracious reply confirming the piece was mine to enjoy. I'm a big fan of his work and have always been rather chuffed with my find.